After an interesting exchange with Zyxzeven, discussing the high temps in earth's thermosphere, I began to wonder if the sun's corona had been measured in infrared. I found that these measurements had not been carried out until the solar eclipse in August 2017. LEESBURG, Va. — Astronomers watching the 2017 solar eclipse from the ground and from the air witnessed new, tantalizing features of the sun’s outer atmosphere. Three teams have recently presented their first science results from the Great American Eclipse. Combined, the findings could help disentangle lingering solar puzzles, such as how bursts of plasma leave the sun, why the outer atmosphere, the solar corona, is so well organized and what is the nature of the corona’s magnetic field. While thousands of eclipse watchers gathered across the country last August armed with special glasses and cameras, solar physicists Adalbert Ding and Shadia Habbal and their colleagues set up a specially designed spectrometer in Mitchell, Ore. (That was one of four sites from which their team monitored the eclipse.) The team had used an earlier version of the instrument, which takes in specific wavelengths of light that can trace different coronal temperatures, to watch a solar eclipse in March 2015 from Svalbard, Norway. NEW AND IMPROVED During the August 21 eclipse, scientists captured the first-ever infrared image of the corona, shown here in an unprocessed form. In both 2015 and 2017, the scientists observed evidence of relatively cool blobs of gas embedded in hot plasma in the outer corona. (The sun’s surface simmers at about 6000° Celsius, but its corona roasts at millions of degrees — and no one knows why.) Ding, of the Institute for Optics and Atomic Physics in Berlin, and Habbal, of the University of Hawaii in Honolulu, measured wavelengths of light emitted by atoms and charged particles called ions in the corona, as a proxy for the plasma’s heat. The team also measured solar material’s Doppler shift, or the change in wavelength as the material moved toward or away from Earth. The shifts suggested that the scientists had caught a huge bubble of plasma erupting off the sun’s surface and fleeing out into space in 2015 (SN Online: 6/16/17). At the time, they thought seeing such an explosion, called a coronal mass ejection, was just luck. If so, their luck held for the 2017 eclipse. The researchers haven’t finished processing all of their data yet, but preliminary results showed uncharged hydrogen and helium atoms fleeing the sun as far out as 3.5 solar radii from the edge of the sun’s bright disk, at speeds of about 600 kilometers per second. Sorry for the repeat if this has already been covered. "The shifts suggested that the scientists had caught a huge bubble of plasma erupting off the sun’s surface and fleeing out into space in 2015 (SN Online: 6/16/17). At the time, they thought seeing such an explosion, called a coronal mass ejection, was just luck." Yet ANOTHER one SOARS off of the Sun! In Eugene Bagashov's most recent Space News presentation, he discussed the path and trajectory of Oumuamua, and offered several possible explanations for its movement through our solar system. Yet this deserves to be present in the overall pool of ideas about Oumuamua. Now remember about the date of the supposed perihelion of Oumuamua, the sun suddenly became very active....So maybe the solar activity at the time was actually not the consequence, but the very reason for the appearance of this object in the first place. What I mean is, could it have been ejected by the sun itself during its peak of activity? Of course, that would be impossible according to the model of the sun used by heliophysicists today, but I prefer to remain open-minded, so I do not rule out such a far-stretched possibility. So maybe Oumuamua did not even arrive from outside of the solar system, but actually appeared from the very center of it. Who knows? Then I believe it would be natural for such an object to be repelled by the sun, as it would most likely bear some positive charge of its own. If the sun were to eject solid material, along with all of the billions of tons of charged particles, would a plasma "bubble" form around the charged object? And would it "race away" as these cooler plasma "blobs" in the corona have been observed to do? I think it would! But either way, in looking at all the possibilities he could think of, Eugene Bagashov gave good reasons why Oumuamua could have been positively charged wrt to the near-sun environment, and may not have displayed like a comet. Is the Corona at MILLIONS of degrees? The frequency/colour is not related to temperature at all. Lightning on earth would relate to a billion degrees Kelvin. In this case the million of degrees Kelvin are related to well known chemical reactions. The Chromosphere: COLDER than you thought! Evidence from Carbon Monoxide Absorption Lines! 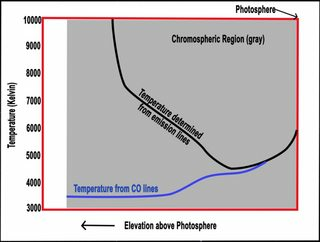 If we look at the chromosphere emission lines we can see different temperatures. Saha equations can not be used. 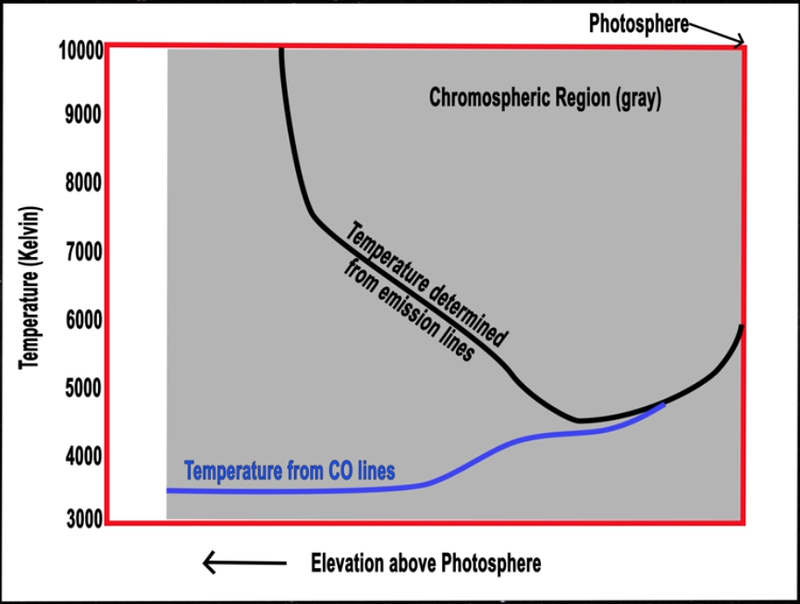 Chromospheric emission lines are not produced by processes in thermal equilibrium. Absorption lines of CO show that the temperature is much cooler. 6000 kelvin (at photosphere) down to 3500 kelvin in a fairly simple curve. Just like you would expect from basic thermodynamics. Left is further from the sun's surface. Related paper: The CO Fundamental Vibration-Rotation Lines in the Solar Spectrum. II. Non-LTE Transfer Modeling in Static and Dynamic Atmospheres Uitenbroek.H. This is a huge problem with the model. But also with the "scientists".